I am constantly surprised that Hong Kong does not pay more attention to its water supply, that something so vital to our city is far from secured by our government. How many of us know that 75 percent of our water comes from the Dongjiang River, while only 25 percent of the city’s drinking water is supplied by reservoirs from within the territory? That while Singapore has similar water concerns, the island nation is investing in technology to conserve, recycle and desalinate water to ensure adequate supply, yet our government simply is not. 1) China is experiencing a significant water crisis and is acting aggressively to ensure its own supply. As Civic Exchange’s Su Liu recently pointed out while speaking on a panel, “We in Hong Kong don’t see the big picture – 40 million compared to our 7 million also rely on the Dongjiang. If water tensions rise on the mainland – where is the priority? ” You can more read about the excellent discussion on China’s water stresses moderated by http://www.ChinaWaterRisk.org’s Debra Tan, here. 2) The Lower Dongjiang River Basin is becoming intensely industrialized and urbanized meaning industrial pollution regionally is a real concern. At the same time, agriculture further inland has intensified and pollutants from farms, such as pesticides and fertilizers are just as dangerous in drinking water as industrial materials. So How safe is our water in reality? Clearly local testing shows that currently the water we drink meets health standards but can we be sure that will always be the case? To my first point, China registers a 50-billion-cubic meter water shortage annually, with two-thirds of cities having trouble accessing water, according to a China Daily article last week quoting Chen Lei, the country’s minister of water resources. In all, China’s water consumption apparently has exceeded 600 billion cubic meters, accounting for 74 percent of the country’s exploitable water resources. In January, the central government issued a document asking the entire country to limit the scale of water exploitation, improve the efficiency of water usage and curb water pollution. According to the article, China aims to reduce water consumption per 10,000 yuan ($1,597) industrial value-added output to less than 40 cubic meters by 2030, raise the effective water use coefficient of farmland irrigation water to above 0.6 and improve water quality. Chen also has said the nation will set water consumption quotas for local governments and continue to perfect the water price formation mechanism in order to promote water resource conservation and protection. So it sounds as though Su Liu has the right idea – the Chinese government priority won’t be to keep prices low and supply constant for the 7 million Hong Kongers drawing ever higher upstream on the Dongjiang. And we are vulnerable. Our water agreement with Guangdong was renewed in late 2011 but only for another three years, until 2014 and for a maximum supply of 820 million cubed meters from the Dongjiang, a major tributary to the Pearl River, 83 kilometers north of Hong Kong. Our current accord commits to this supply regardless of drought. 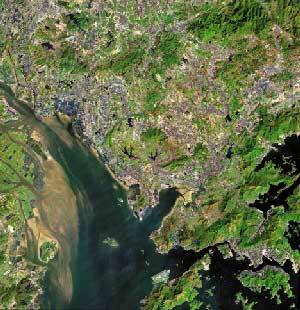 But the river also supplies fresh water to seven other cities, including Guangzhou, Dongguan and Shenzhen. All of those cities, however, have seen allowances decreased during drought years so will Hong Kong continue to receive privileged treatment? At the same time, we would be ill-equipped for any water rationing. As China Water risk has pointed out here, Hong Kong uses more water per capita than Paris, London, Singapore or Melbourne and over 50 percent of our water is for domestic use. This compares to just 15 percent of water usage in China being for municipal use. Part of the problem is that our tariffs are among the lowest in the world. As CWR points out, the first 12 cubic meters of water used every four months is free for all domestic users. Countries with comparable GDP per capita such as Netherlands, Switzerland and the U.S. all have higher water tariffs. But tariffs are also low in China and the expectation is that with a push on the mainland toward water conservation, pricing will likely at some point rise to a water tariff level of 2-3 percent of average household income. That should also translate to higher prices in Hong Kong. Turning to pollution, I have written several blogs on the lack of enforcement of water quality standards in China. The intense industrial development throughout China, but particularly in the south, has helped fuel annual GDP growth in the double digits but it has also rendered many rivers, lakes and reservoirs, indeed much of the country’s groundwater, essentially useless for agriculture or consumption. Of the country’s 26 key lakes and reservoirs monitored, only 23 percent fall within grade 1-111, while 19 percent of China’s seven major river basins monitored are considered essentially useless. Finally, almost 74 percent of groundwater is considered grade IV-V standard, or excessively polluted. More information on China’s water pollution can be found here. We should remember that a river collects the water in its basin and that means that all the pollutants within the Dongjiang Basin could potentially end up in Hong Kong’s water supply – not a pleasant thought. Will we have to wait for a major accident on the Dongjiang or its feeders before the Hong Kong government wakes up to our vulnerability? For now, Hong Kong water quality data, although only through September last year, can be found here, on the Water Supplies Department website. Hong Kong consumers have the ability to sustain a significant tariff hike. That would help us move toward greater water conservation and at the same time provide the resources for the city to invest in making options such as desalination and water recycling economically viable. What are we waiting for?